A second Newmarket trainer has been charged by the British Horseracing Authority after nine racehorses tested positive for banned anabolic steroids. Gerard Butler, 47, has admitted giving horses the Sungate product for injured joints, but said he had been assured the substance did not breach rules. All nine horses have been suspended and Butler could face a penalty from a fine to a 10-year ban if found guilty. Godolphin trainer Mahmood Al Zarooni was given an eight-year ban in April. A date and panel for the hearing have yet to be announced. A Touch Of Fashion, Flemish School, Azrag, La Belle Epoque, Rainbow Beauty, Zain Eagle, Zain Queen, Zain Spirit and Prince Alzain are the nine horses which tested positive. 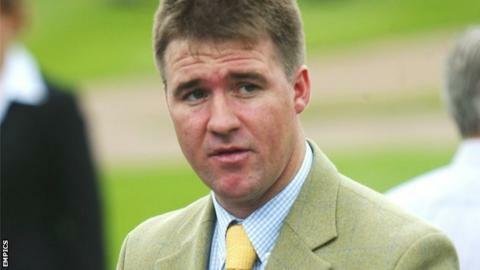 But Butler, 47, said more than 100 horses in Newmarket will have been given the same drug. The BHA confirmed earlier this week it was investigating after obtaining positive samples during tests at the trainer's yard on 20 February. Butler has been charged with seven breaches of BHA rules, including three relating to "administering intra-articular injections himself" to several horses. He said the drug - called Sungate, which contains stanozolol - was recommended by a vet. "Over the last few days I have been very uneasy about the Al Zarooni case and felt that I needed to let the general public know what has happened in my yard," said Butler in April. "Now I would like only to concentrate on helping the BHA with their investigation." Butler's most notable winner was Compton Admiral in the 1999 Eclipse Stakes at Sandown. The nine horses have won a total of nine races between them, winning combined prize money of £22,594. Azrag has won four races to earn £5,651, while three-time winner Prince Alzain has earned £12,615. The BHA said a wider investigation into Sungate, which is developed by an Italian company, was continuing. In a statement, the governing body said: "The BHA has spoken to several trainers to establish the extent of the use of the product. "Once all relevant information has been collated, a decision will be made as to how to proceed with this investigation. "No definite timescale can be placed on this wider investigation at present." Butler was born in Ireland and picked up experience at top training yards around the world before settling at Egerton House Stables in Newmarket five years ago. Unlike the Al Zarooni case, Butler said the treatment came recommended by vets and he included the injections in his official medical records which were seen and returned by the BHA without comment. He believes Sungate has been "misunderstood by many others". Eleven of Al Zarooni's horses were caught by drug testing, while he also admitted to doping four others. Four tested positive for stanozolol. The other seven, including former 1000 Guineas favourite Certify, were found to have ethylestrenol in their systems. Al Zarooni trained for Godolphin, run by the ruler of Dubai, Sheikh Mohammed bin Rashid Al Maktoum.